"What a pleasure it was to jump back into co-authoring with my dear friend Leslie Gould! We've so enjoyed writing together in the past, and I was eager to do so again, especially once she shared with me her concept for a series about a family of French Huguenot refugees and their modern-day descendants. I think the joy we shared in collaborating on My Brother's Crown is reflected in the story, which I'm hoping will make it as fun for you to read as it was for us to write!" "A trip to France to research the historical thread of My Brother's Crown was a dream-come-true for me. As I trekked the cobblestone streets of Lyon, strode along the Seine in Paris, and explored the outside of an old warehouse in Le Chambon-sur-Lignon, our historical character Catherine 'walked' with me. My hope is that readers will experience the same intrigue I did as I researched this story—and then the delight I felt writing with Mindy once again! "This is a fascinating start to a new series by Clark and Gould." "The story was intriguing and full of suspense and kept you turning pages." "Skillfully researched and lovingly written, I found My Brother's Crown to be a much admired, totally enjoyable and thought provoking read." "I look forward to reading the other novels in this series." "I loved every word of this story; it is well-written and thought out." "This is a novel to follow, and re-read." "I am amazed at the vast cast of incredibly well developed and written characters..."
"I found this book to be unique in both setting and story." "The story is fun to read and flows well." "I love historical fiction and this book does a great job of combining two different eras of time." "With likable characters, a fascinating historical setting, and an intriguing plot that kept the pages turning, My Brother's Crown is another winner from the dynamic writing team of Clark and Gould." "Welcome to the first book in the 'Cousins of the Crown' series. Ms. Clark and Ms. Gould have done a tremendous job of weaving 1685 France and Present Day Virginia story lines together. Catherine and Renee are wonderful characters that the authors have breathed life into and that we root for them to succeed. My Brother's Crown is a lot of fun and it entertains you as you keep flipping pages as you try to find out what is going to happen next. Ms. Clark and Ms. Gould have a great way of telling the story and moving it along at a nice pace. A really enjoyable read. I am so looking forward to the next book in this series." "I more than enjoyed this novel! It has so much to offer; romance, mystery, and historical facts to name a few." Mindy and Leslie do not disappoint. This book is reminiscent of Mindy’s first series the Million Dollar Mysteries. The present day characters are very believable. I could not put the book down. It is classic Mindy Starns Clark - Romance and Mystery. The historical portions are also very interesting. I couldn’t wait to start the second book in the series. Once you start reading “My Brother’s Crown” you will not want to put it down. This book, written by Mindy Starns Clark and Leslie Gould, will capture your attention from the very beginning. There are surprises around every corner as you read this book. The authors really brought the characters to life in each of the settings. This book was so very interesting and I am definitely looking forward to reading the next book in this series! My Brother’s Crown combines modern day happenings in Virginia with a story from France in the 1600’s. The connection is shown in an intriguing and detailed way. I learned a lot about the history of the Hugenot’s. There is much to be learned from reading this great story. I look forward to the next book in the series. My Brother’s Crown is like reading two books in one as the story goes back and forth between 1685 France to present day Virginia following cousins story and a quest to uncover their family’s mysterious past and the impact it has on the future. This is an amazing historical story full of suspense, mystery, religious persecution, romance, danger, love and strong faith. The strong characters drew me into their lives and had me on the edge of my seat during the tense, dangerous scenes and kept me turning the pages to find out what would happen next. The author’s research is shown in the historical details and descriptions and I could picture everything in my minds-eye as I read. A well written and captivating story. "Being somewhat of a science buff and puzzle lover, I enjoyed the two main characters and their chemistry and puzzle solving. I have enjoyed all of the books these ladies have coauthored, but I believe this one is my favorite. I cannot wait for the next book!" "I thoroughly enjoyed reading this book. I am a huge fan of historical fiction, yet I did not know much about the Huguenots or that period in history. My Brother's Crown was well researched and gave lots of details about life in 17th century France." "My Brother's Crown did not disappoint. Love it when I read a book, that I'm drawn in by the present day mystery, yet learn something new as well." 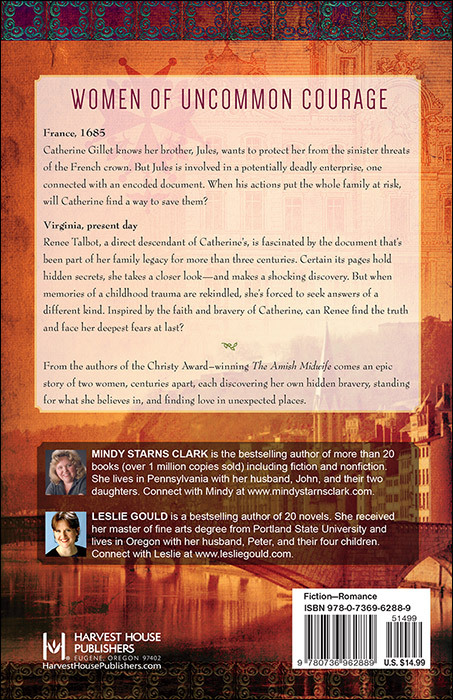 "Mindy Starns Clark and Leslie Gould are gifted authors in their own right. But there is a certain kind of literary magic that occurs when the two collaborate on a novel. My Brother's Crown has left me begging for more!" "My Brother's Crown is a fantastic read that kept me turning the pages even when I kept telling myself, 'I'll finish this chapter then put it down.' I ended up reading a lot more than one chapter in a sitting. I especially enjoyed the historical aspect and how seamlessly the authors tied it in with the present day story. This is a wonderful book that I highly recommend." "My Brother's Crown is absolutely brilliant! It is one of the best books that I have read in a really long time. Mindy Starns Clark and Leslie Gould have delivered a masterful book with great characters—this collaboration is perfect! The storylines running back and forth from the past to present made for such an enjoyable read. I highly recommend it for anyone. The ending left me wanting more. Can't wait for book two!" "I really enjoyed this book! I love historical fiction and this book did not disappoint me! Previously, I didn't know much about the plight of the Huguenots, so this intrigued me. I appreciate the authors sticking to the morals of the Christian faith when they were writing this book. They showed in many ways how we as Christians today, should live our lives in the great and small ways. I fell in love with the characters of this book and can't wait to read more of their story!" 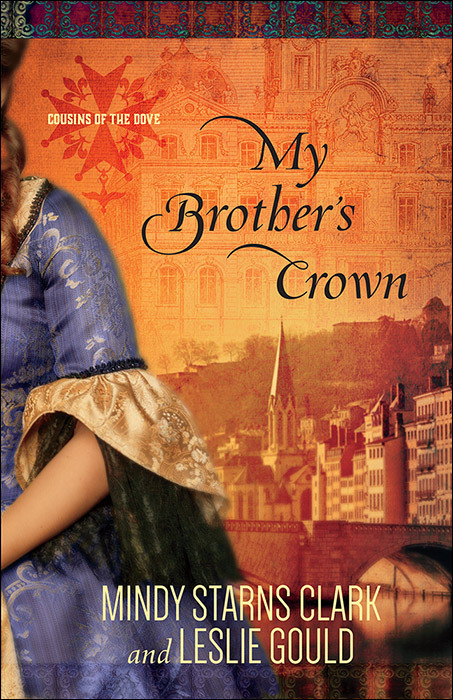 "My Brother's Crown offers two stories in one novel, with the 18th-century saga of persecuted Huguenots entwining with the modern tale of mystery and family. These alternating adventures combine for a compelling read. We eagerly await the next book in the Cousins of the Dove series." "I read My Brother's Crown and enjoyed the mix of historical fiction with the real life challenge of getting over childhood trauma in order to live the life of an open heart to people and God's good gifts to us. As a high school history teacher, I particularly enjoyed learning more about the Huguenots and how their story of courage can give us courage today." "I truly loved this book. The historical perspective alongside the modern day account was very intriguing. I enjoyed the romance on both sides and it kept me guessing until the very end. Very enjoyable book!!!" "I enjoyed this book. The flow between the past and present is flawless. I also enjoyed the history that is woven into the story. Well written and enjoyable. Another success." "This is an amazing historical story full of suspense, mystery, religious persecution, romance, danger, love, and strong faith. The strong characters drew me into their lives and had me on the edge of my seat during the tense, dangerous scenes and kept me turning the pages to find out what would happen next. A well written and captivating story." "My Brother's Crown combines modern day happenings in Virginia with a story from France in the 1600's. The connection is shown in an intriguing and detailed way.... There is much to be learned from reading this great story. I look forward to the next book in the series." "The story is so captivating I found it most difficult to put down as it contained everything needed in a great novel to keep you on the edge of your seat."